Drains clog for many different reasons; from simple hair clogs to tree roots in your sewer line. The Plunger and drain cleaning liquid rarely work, but what will always give you the solution to your drain problems is The Rooter Drain Expert. With the best tools in plumbing industry (Snake Drain Cleaning Machine, Hydro Jetter Drain Cleaning Machine). We have years of experience, and as the local Pasadena plumbers we offer you the best prices with less overhead. Your sewer line is underground and normally a couple of feet underground. 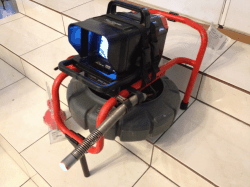 To see inside your sewer line we use an special camera that give us an inside look of your sewer line. 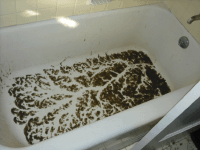 A blockage caused by roots will make your sinks, bath tubs and other drains back up, it is a very disruptive problem to prevent unexpected long interruptions you can have regular camera inspections of your sewer line. If during the camera inspection we discover that roots have invaded you line, the best next step to follow will be recommended by our plumbers. 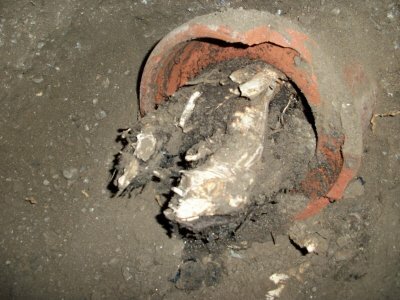 How Roots get into sewer lines? Roots are an important element of plants and trees, and one of their main function is to provide water to the tree. Root grow in the direction of water beds underground, in an urban environment sewer lines are artificial underground water beds which can provide the tree with the water it needs. The old clay sewer pipes come in segments of 3-6 feet and joints are needed to install a sewer line, new ABS pipes are made of plastic. The Rooter Drain Expert has offer its plumbing services to Pasadena for many years. With the best tools, and best customer services big corporations cannot match. Being local we have less overhead, and we can provide you with a personalized customer service. Plumbing is heavily regulated by the city and state, all plumbing work most be up to code. The Rooter Drain Expert is a licensed insured and bonded plumbing company, so you can have the peace of mind everything is up to code and regulations. For your safety we do not recommend for you to hire unlicensed plumbers please read “Why hire licensed plumbers?” so you understand the risks you take when hiring unlicensed plumbers. The Camera Inspection provides an inside look to the sewer lines. Trench-less pipe replacement reduces excavation by up to 95%. We are the Pasadena plumbers and we do everything we can for you to be one more of our happy customers. Pasadena has a rich history and many institutions recognized nationally and world wide. If you would like to know more about Pasadena, you can find more information at Wikipedia, Pasadena CA.